I thought she was the luckiest girl, all those boxes stacked everywhere and unlimited cookies at your fingertips, right? Now, I know that all those boxes would a.) drive me nuts (I like a clean space, please and thank you) and b.) be too tempting to pass on, especially the Samoa cookies. Yep, I am firmly in the Samoa cookie lovers camp and I am never coming out! The next logical step in my cookie fandom just seemed to be making a vegan samoa cookie milkshake, right? Hands down, Samoa cookies were always my favorite Girl Scout cookie growing up. Even though Thin Mints are a classic and I always found a box hidden away in the freezer, Samoas were the first to go in our house. As the years passed and I started to grow out of the Girl Scout thing, the cookies started changing too. When low-fat cookies started entering the market and lemon cookies were deemed a new favorite (it doesn’t have chocolate, so why?! ), I knew it was my time to move on. Lucky for me, even though I moved on, my favorite coconut/chocolate/caramel Girl Scout cookie lives on in milkshake form! I didn’t think this through before I started throwing it together into the blender, but toasting the coconut would make everything here extra awesome and coconut milk would just take this milkshake up one more notch. I ended up using almond milk with a couple tablespoons of cashews added in for creamy factor, but feel free to sub in whatever you have on hand! Also, just keep a container of this vegan caramel sauce around always, you won’t regret it. These would also be perfection topped with a creamy vegan meringue if you want to get fancy. Also! If you are a caramel/cookie combo lover like me, these caramel stuffed beauties are the ultimate in indulgent cookies that won’t make you feel blah afterward. An easy and sweet vegan samoa cookie milkshake, this is the perfect treat that comes together in no time! Full of vegan caramel, coconut, and SO much chocolate. To make the caramel sauce: Blend all the ingredients together until smooth, transfer to a small bowl and set aside. To make the milkshake: Blend together the ice cubes, coconut, milk, cashews, vanilla extract, caramel sauce, cocoa powder and chocolate until smooth. 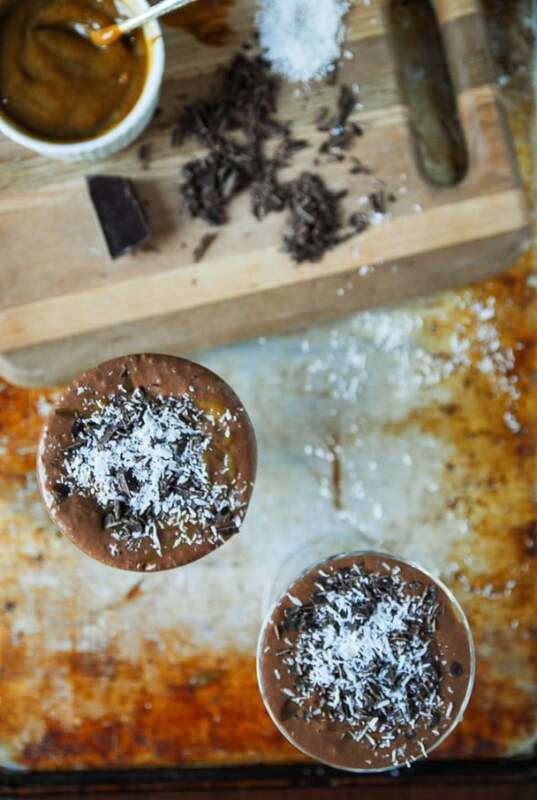 Serve in glasses topped with more coconut and chopped chocolate. Samoa cookies in a milk shake? I’m in! I have my woodturner cooking hot in Buffalo, NY and now I just need my shake. Yes! That balances it out, right? Be there in a jiffy with caramel sauce in hand! I vaccillate between Samoas and Tagalongs. Thin mints are good but kinda overdone. These shakes look fantastic. Agreed! Thin Mints are classic, but I forgot about Tagalongs! I’m glad to hear you had an awesome girls weekend! 0 degrees? Yikes! Stay warm, lady!! Just like you, my top two girl scout cookie faves were Thin Mints and Samoas…there’s just no topping those things! And frozen thin mints are where it’s at! Love this recreation of the deeelish Samoa! It’s been ages since I’ve had a milkshake, so I’m fixing to slurp this sucker down so hard, regardless of the massive brain freeze! Thanks friend! I’ll always take a milkshake, regardless of the freeeezing temps! Ohmyword – yum!!! Love samoas! This milkshake looks stellar. Definitely going to have to give it a try! you are genius – this milkshake sounds fantastic! the Samoa has always been my favorite too – when I was a girl scout, some extra boxes may have ended up as “leftovers” that we had to purchase each year. This looks so yummy! Wow! Check out my Vegan Salted Dark Chocolate Cookies! This is just screaming my name! These look soooo good. Samoas are also my favorite girl scout cookie, hands down. And I love that it is vegan and has so many good things in it. It’s pure awesomeness. Samoas in milkshake form! I’ll drink this all day long! Yup, it was samoas…. years ago. I’ve not touched GSC in years… yes, years! So this shake with that incredible caramel sauce must happen, like tomorrow! I am ready!! I’m a thin mint gal myself and most years stash a box away in a dresser drawer for a personal crisis. Nothing like a box of Girl Scout cookies for a crisis. Love your pictures–this is not good for my diet. I love that, ‘for a personal crisis’, but it’s necessary, right? !